What's new with the age old chant? REGORIO HAS A WIKI. You can find it over at gregoriochant.org. It has links to the official page, the web interfaces, even our own video tutorials! It promises to be the central place for all those quirky tips and tricks that come up on the mailing lists too. And if you want to check out the mailing lists, the links are at gregoriochant.org. What is a wiki? The word “wiki” comes from a hawaiian word for quick. It has come to describe a webpage where people can collaborate easily, editing as they go. The idea relies on a bunch of people working together. It is exciting to see people from all over the world on the gregorio mailing lists. The open source software is helping communities everywhere communicate the music of the Church. The latest development is a new idea for notating the old squiggly neumes known as semiology. The work is in it’s infancy, but you can see the first concepts taking shape here. The picture here shows one sort. There are several types, take Aaron Mack’s photos from Benevento Cathedral for another example. Now, I am not a semiology sort or person, but the idea of little squiggles instead of the four lines has some appeal, especially dealing with choir members who don’t read music. 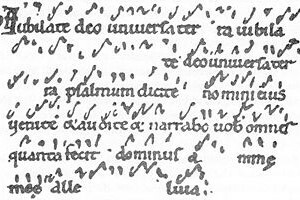 Perhaps pointing psalms with squiggly neumes might be easier for the musically illiterate.